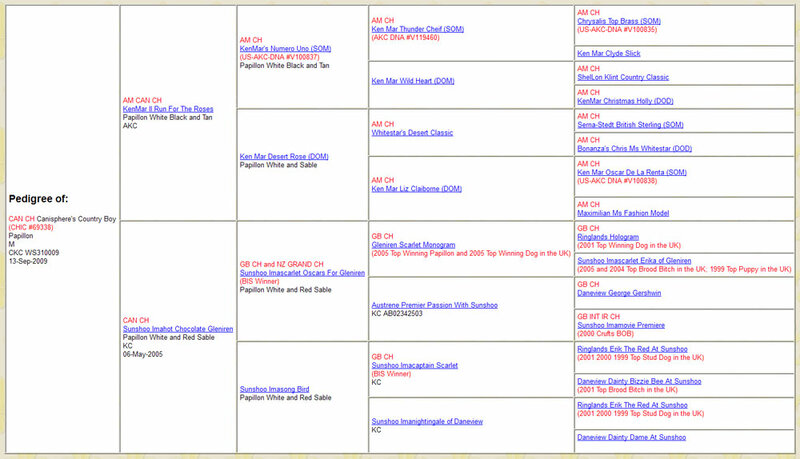 Sire: AM CAN CH Kenmar II Run For The Roses (USA) "Derby"
Dam: CAN CH Sunshoo Imahot Chocolate At Gleniren (GB) "Cadbury"
We are so fortunate to have Jackson join us here at Prestwick. 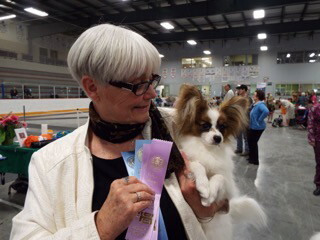 Thank you Karen (Papillons of Canisphere) for entrusting us with this very special young man. He is all you can imagine, a Papillon to be. His delightfully mischievous attitude is a joy to live with. In the ring, he finished quickly from Puppy Classes with multiple Best Puppy in Group placements and a BOB over Specials on to Group 3 placement. A flashy boy with an incredible headpeice: correct stop, striking pigment and beautiful butterfly ears . A solid front, medium length of neck to solid top line and a full plume, high tail-set finish a nicely balanced profile. Jackson brings all this and more to our program here at Prestwick. I feel so fortunate and honoured to have this stunning male join my program here at Prestwick. 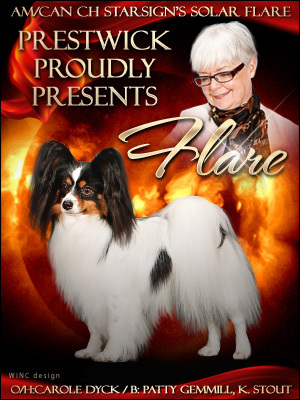 Flare brings with him such presence and confidence, a true joy to live with, and an honour to present in the ring. He is so solid of mind, the animation and spark in his eye makes me smile, coupled with that elegant profile when on the move, Flare is indeed so special. 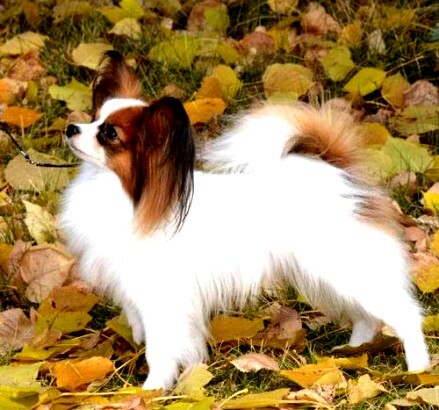 I thank Flare's breeder Patty Gemmill of Starsign Papillons for knowing this was the boy for me and although it was tough for her to let him go, I thank her for entrusting me with such a stellar young male. Soon, maybe, we will see little Flare babies in the ring. Can't wait. Cole is so full of himself! So much fun to show, always nailing his self stack. You have to love a dog with that, "Hey, I'm here, look at me" attitude. He is a lovely blend of Jackson and a little Flare. I can't wait to see what he will bring to my program here at Prestwick.